Each month we bring you the best braces friendly recipes we’ve found online. These delicious veggies are packed with nutrients, and are soft enough for your braces. Enjoy! Preheat oven to 180C/160C fan forced. Heat oil in saucepan over medium heat. Cook onion, stirring, for 5 minutes or until soft. Add garlic. Cook for 30 seconds or until aromatic. Add tomato paste. Cook, stirring, for 1 minute. Stir in tomato and water. Bring to boil. Reduce heat to low. Simmer for 10 minutes or until thickened. Season. Spread over a baking dish. Place couscous in a heatproof bowl. Add boiling water. Stir. Cover with plastic wrap. Set aside for 4 minutes to absorb. Fluff with a fork. Add tomato, herbs, garam masala, seed mix, currants and feta. Stir to combine. Scoop out zucchini flesh, leaving 1cm shell. 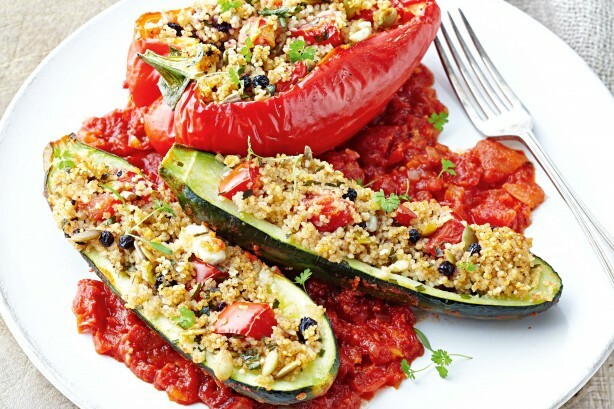 Fill zucchini and capsicum with couscous mixture. Place in dish. Cover with foil. Bake for 30 minutes or until vegies are almost tender. Remove foil. Bake for 5-10 minutes or until light golden. Sprinkle with herbs.